According to recent reports from national and international research teams, approximately one-third of all cancers can be prevented by maintaining a healthy weight, eating a healthy diet, and exercising regularly. Published studies have indicated that obesity plays a major role in cancer development through a number of biological mechanisms. Since the American Cancer Society (ACS) last published guidelines on nutrition and physical activity for cancer prevention in 2006, there has been mounting evidence addressing the role of obesity in the development of cancer. While it is not a new concept that daily exercise is important to helping prevent cancer, what has emerged in the literature is that prolonged sitting time (eg, watching television or sitting at the computer) also appears to significantly increase risks. Patients should also be advised to make it a priority to exercise and avoid sitting for prolonged periods every day. “If patients are starting a new exercise, it may be beneficial to have them begin with activities that engage different muscle groups,” Dr. Bandera explains. Finding activities that increase strength, flexibility, balance, and cardiovascular health is important because patients may be less likely to become bored. The ACS guidelines also note that it is important for both patients and physicians to understand the differences between moderate- and vigorous-intensity exercise (Table 2). “The intensity of the exercise determines how quickly optimal levels are reached,” says Dr. Bandera. She adds that the more patients engage in activities that they enjoy, the more likely it is that their exercise program will be sustainable. Regarding diet, Dr. Bandera says patients should be advised to choose mostly plant-based foods, including a variety of fruits and vegetables each day, and whole grain products instead of refined grains. “What patients eat is almost as important as how much they eat,” she notes. “Portion sizes in the United States have become too large to help maintain a healthy weight. Patients should be educated about proper portion sizes with concrete examples of just how big or small certain portions should be.” Dr. Bandera adds that men and women should be counseled appropriately on drinking alcohol in moderation. Click here to view full guidelines from the American Cancer Society. 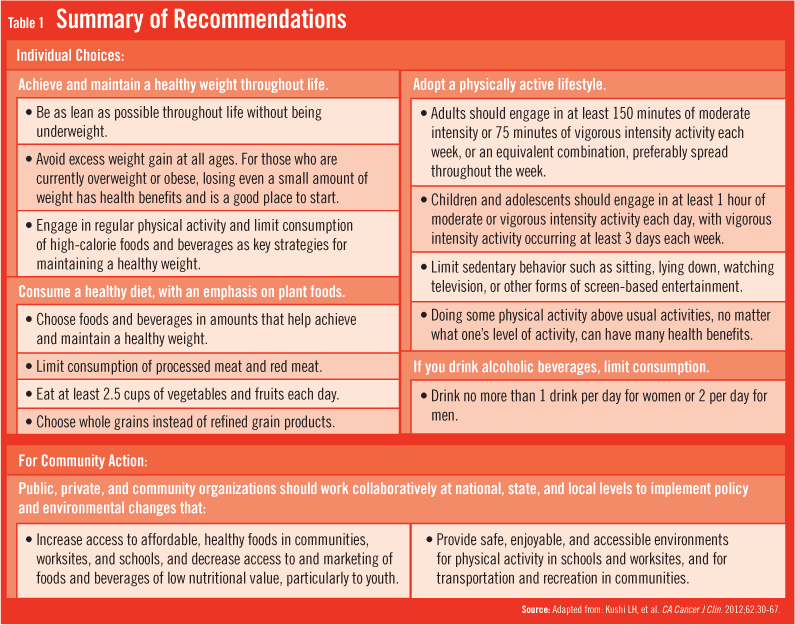 Kushi LH, Doyle C, McCullough M, et al; American Cancer Society 2010 Nutrition and Physical Activity Guidelines Advisory Committee. American Cancer Society Guidelines on nutrition and physical activity for cancer prevention: reducing the risk of cancer with healthy food choices and physical activity. CA Cancer J Clin. 2012;62:30-67. Available at: http://onlinelibrary.wiley.com/doi/10.3322/caac.20140/full. McCullough M, Patel A, Kushi L, et al. Following cancer prevention guidelines reduces risk of cancer, cardiovascular disease, and all-cause mortality. Cancer Epidemiol Biomarkers Prev. 2011; 20:1089-1097. Piernas C, Popkin B. Food portion patterns and trends among U.S. children and the relationship to total eating occasion size, 1977-2006. J Nutr. 2011;141:1159-1164. Mink M, Evans A, Moore C, et al. Nutritional imbalance endorsed by televised food advertisements. J Am Diet Assoc. 2010;110:904-910. Owen N, Healy G, Matthews C, Dunstan D. Too much sitting: the population health science of sedentary behavior. Exerc Sport Sci Rev. 2010;38:105-113. Biro F, Wien M. Childhood obesity and adult morbidities. Am J Clin Nutr. 2010;91:1499S-1505S. Byers T, Sedjo R. Does intentional weight loss reduce cancer risk? Diabetes Obes Metab. 2011;13:1063-1072. McTiernan A, Irwin M, Vongruenigen V. Weight, physical activity, diet, and prognosis in breast and gynecologic cancers. J Clin Oncol. 2010;28:4074-4080. Miller P, Lesko S, Muscat J, et al. Dietary patterns and colorectal adenoma and cancer risk: a review of the epidemiological evidence. Nutr Cancer. 2010;62:413-424. Elisa V. Bandera, MD, PhD, has indicated to Physician’s Weekly that he has or has had no financial interests to report.